Cops in California recently played chauffer to a very special V.I.P. guest. 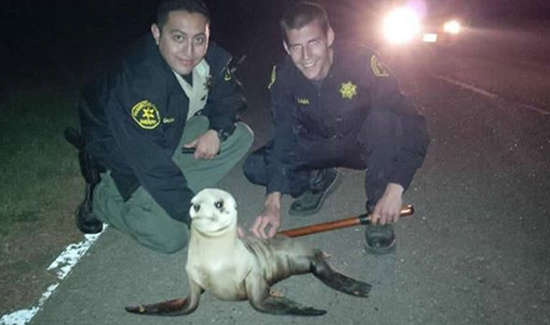 According to the Huffington Post, a sea lion pup was found at 1 a.m. on a foggy stretch of Highway 1, just south of Fort Bragg and about a quarter of a mile from the ocean, said Mendocino County Sheriff’s Deputies. “Due to the darkness and the dense fog the animal was very difficult to see and would have certainly been struck by a vehicle if the deputies had not stopped,” the department said in a news release. VIDEO: She’s Clearly a Spy!